1 Find A Grave, (accessed 06/21/2013). 2 New England Ancestors Magazine, 2000, Vol. 1, No. 3, Page 43, New England Historic Genealogical Society (Online Database). 3 New England Historical and Genealogical Register, (New England Historic and Genealogical Society), 1943, Vol. 97, p. 343. 4 The Virginia Magazine of History and Biography, Virginia Historical Society, Apr 1942, Vol. 50, No. 2, Page 180, JSTOR (Digital Library). 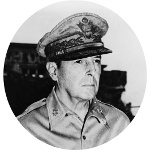 5 Wikipedia, "Douglas MacArthur", (accessed 06/21/2013).